Lake Tahoe is the largest alpine lake in North America and offers great hiking, boating, camping and photography for all ages. 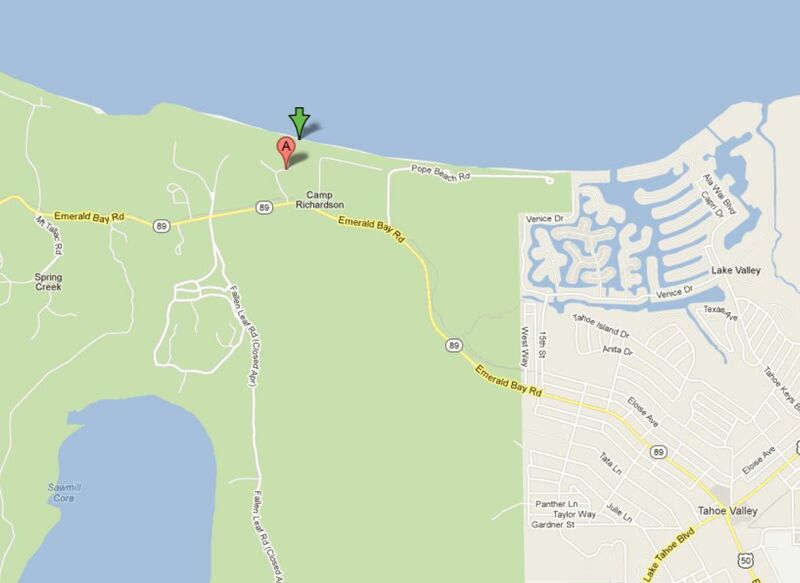 Download free directions, maps, GPS and photo advice for Emerald Bay by selecting the Maps and Directions tab above. Lake Tahoe is a large freshwater lake in the Sierra Nevada of the United States. At a surface elevation of 6,225 ft, it is located along the border between California and Nevada, west of Carson City. Lake Tahoe is the largest alpine lake in North America. Its depth is 1,645 ft (501 m), making it the USA's second-deepest (the deepest is Crater Lake in Oregon, being 300 ft (91 m) deeper, at 1,945 ft (593 m)). Additionally, Lake Tahoe is listed as the 26th largest lake by volume in the world at 122,160,280 acre. Lake Tahoe is a major tourist attraction in both Nevada and California. It is home to a number of ski resorts, summer outdoor recreation, and tourist attractions. Snow and skiing are a significant part of the area's economy and reputation. Mountain and lake scenery are attractions throughout the year. The Nevada side also includes large casinos. Highways provide year-round access from Reno, Carson City, and Sacramento. Camp Richardson Resort and campground is located about 2 miles northwest of the town South Lake Tahoe on route 89. For Google Maps driving directions to Camp Richardson click the green "View Map" icon and then select "Get Directions" in the upper left hand corner of Google Maps. The best time to photograph Lake Tahoe is early May just before the summer resorts and campgrounds open up for the summer. The downside to early May is most of the state park gates are closed so accessing some the areas requires longer hikes, so bring or rent a bicycle. The area around Camp Richardson is open year round and there is a popular restaurant a few hundred yards from this dock. The best time to photograph the Camp Richardson dock is sunrise when there is a less people on the dock and lake. Photo: Sunrise April 2012. Download a free copy of the Four Factors of Filter Highlight Photography in PDF format by selecting the “ebook download” tab above. This 37 page guide covers how to take a single image and apply minor manipulations that will help you produce consistent reproducible results. You will also learn the processes of camera set-up, image editing, and advance scouting techniques used by professional photographer Christian James. Free park maps, tide reports, ebooks and additional information can be found under the Maps and Resource tab located in the black bar at the top of the screen. The best time to photograph this locations is sunrise. Nikon D3x 14-24mm Lens @ 17mm f16@ 1 second ISO 50 Exposure Value -5.3 with a 3 Stop (0.9) Soft-Step Spilt ND Filter. 4/25/12 5:12 a.m.